Who knew a nutmobile existed? 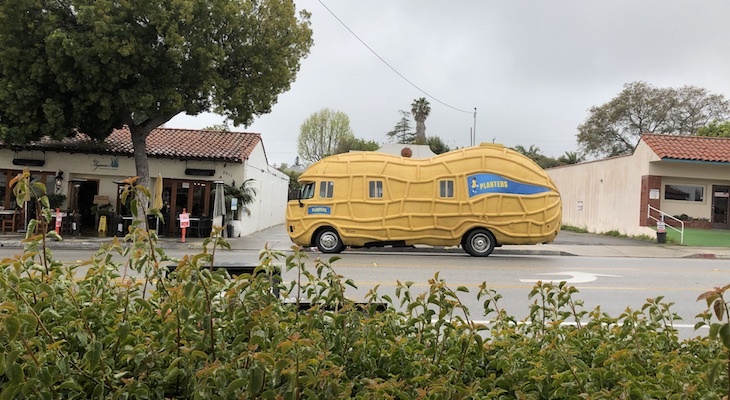 Santa Barbara has been graced by the presence of the Oscar Mayer Weinermobile and the Idaho Potato truck, but never have we heard of a Planter's Peanut Nutmobile. While meeting at Daily Grind this morning, we happened to see a very unusual van of sorts slowly drive down De La Vina. Upon closer inspection, we noticed it's indeed a peanut vehicle with Planter's logo on the side. Further investigation learned it's called the "Nutmobile" and travels around the country spreading curiosity, joy, and we assume, peanuts. Apparently, the vehicle is based on a 2011 Isuzu Series NPR with solar panels, reclaimed wood flooring, and a wind turbine built into the roof above the cab. It's driven across the country by recent college graduates interested in marketing, public relations, and peanuts. So cool, I saw this on Edhat yesterday and last night saw a TV commercial with the "Nutmobile". As a kid I really liked Planters ... Peanut Plank ... or was it Peanut Bar? Haven't seen it in a long time. cruised through town last year too! I too saw it parked at the Best Western Plus hotel parking lot on upper state street. Maybe the driver is staying there? His sign read; "Will work for elephants". Parked at the Upper State Street Pepper Tree motel........ waiting for Target to open? Potato does not end in "e"
While it's true potato does not end with an "e", potatoes does. But what's it got to do with peanuts??? But "toe" does. English has a lot of odd or inconsistent spellings, ignoring archaic, idiomatic and regional usage. It's like stew: adds whatever is handy. Don't be too hard on those who struggle--and add those who, like me, find Auto-correct annoying and frustrating!